One of the most troublesome developments for Americans who like democracy is the rise of the "top-two-go-through" voting system. America's political system is already rigged to ensure that Democrat or Republican partisans always win, but this new voting system is set to make things even worse. Under this new system, a primary election is held among all candidates (of whatever party) for a particular office. Only the two who receive the most and second-most votes may compete in the "general election." In a nation with a healthy multi-party democracy, a case can be made for such a voting system, but in a political duopoly such as exists in the USA, maintained by federal laws that protect that duopoly against ballot access and media access by others, such a system is pro-Establishment and anti-Democratic. It ensures that even insurgent non-Republicrat candidates are excluded from general elections, and prevents their ideas from being presented to the electorate. The simple "most-votes-wins" system at least allows a strong third-party or Independent candidate to force the "major" Republican or Democratic candidates (his opponents) to campaign hard to secure a win against the potential "spoiler" effect of an Independent's pulling enough votes from the Republican (Democrat) to let the Democrat (Republican) win. In contrast, the new "first-two-go-through" system allows the dominant party in very red or very blue districts to fill both slots on the ballot, securing the seat for the party without having to spend even a dime to compete with anyone else. A better name for such a system might be, "The Establishment Always Wins". In such a system, running for Congress as an Independent in a deeply blue or red district with an entrenched incumbent would take a great deal of audacity and conviction. Running for Congress in Washington's 7th district, Ron Bemis has both. New to politics, he is simultaneously taking on both the "Establishment Always Wins" system and a 24 year-seated Democrat incumbent. His district includes Seattle, where the politics are much bluer than the sky. Bemis' positions, the success he's already had, and the larger implications of his efforts for American politics make his attempt compelling. Ron Bemis is a grassroots, pro-liberty, fiscally responsible Independent who wants government out of our bedrooms, relationships and personal morality. Accordingly, he doesn't see the country in terms of Left vs. Right, and he refuses to be put in a party box. If you ask him really nicely, he still won't tell you for whom he will vote for President or, for example, his personal view of abortion, which he rightly says is not germane for a candidate for Congress who intends to keep his oath to govern within the confines of the Constitution. Like an increasing number of Americans, he understands that our politics are much more about them vs. us than left vs. right. "Them" comprises a political and economic class that continues to remove our basic rights and wealth to promote their own agendas, while "us" is the majority whose liberties and prosperity are being diluted by both parties. Bemis spent just two months campaigning in his district's primary, during which time he was outspent 15:1 by a historically high-spending 'Big Money' challenger. Not only did Bemis trounce the big spender: he received more votes than all of his challengers combined except for the long-seated Democratic incumbent, Jim McDermott. But Bemis' greatest success was to ensure that the said incumbent did not pull the 80% of votes that he has long gotten used to receiving in this extremely Liberal city, but instead received his lowest share of the vote of any election (primary or general) in his 24 years on the job - a full 12 % lower than in each of his past four elections. That success was enough to put Mr. Bemis in the two-candidate general election for Congress - all on a paltry campaign budget of $16K, which didn't include a cent from the GOP or DNC. By any measure, in his effort to take on an Establishment candidate in a pro-Establishment electoral system, Bemis is doing unusually well. McDermott, the man Bemis is trying to beat, is a Big Government Democrat who has voted to spend about 1000 dollars for each dollar that he has voted not to save- and that ratio has been increasing in recent years. As a non-partisan, Bemis is not coming at McDermott on ideological grounds. Rather, he is making a case on simple principles and common sense. Advocating for a reining in of government, he nevertheless appeals to values that the Liberal majority of his District - and most Americans - care about. As he says, "That huge debt burden on us, and especially on every child and young person, is not fair, not caring, not progressive, not right," adding that, "the US Government is overextended both domestically and internationally." Perhaps that is why at a recent campaign stop in Montlake, as blue as any other neighborhood in the city, one lady approached him to say, "I've always voted Democratic, but I'll vote for you this time." Bemis needs a few thousand like her and, by all accounts, is finding them. Indeed, McDermott's ongoing refusal to participate in a proper public debate with Bemis is starting to look like the strategy of a man who's worried about losing. Interestingly, Bemis is garnering the support of heretofore Democrat voters despite having ticked a box to indicate that he "preferred the Republican party" when submitting his papers to run. In fact, Bemis has not been a member of either party since for the last forty years, nor has he anything very positive to say about any Republican president (or Democrat president for that matter) since Reagan. More to the point, he is not taking a red cent from the GOP. It's perhaps unsurprising, then, that the Republican with whom he sees most eye-to-eye is Ron Paul, and like his namesake, he doesn't like what the Republican party has become. Rather, he recognizes that whereas both parties are equally guilty of taking down our civil liberties and spending without limit, the beach-head for a return to sanity seems to be larger among Republicans. However, his favorite answer to the "why Republican-preferring?" question is that caucusing with the Republicans, who will be in the majority in the next Congress will be enable him to ensure that his principles have some positive, practical effect. That very pragmatic view of party as a vehicle for a greater good - as a means to an end, rather than an end in itself - and the fact that Bemis is a non-partisan liberty candidate who is making his case to a mostly Liberal audience make him something of a model "Blue Republican". As the originator of that term to describe voters with a more liberal sensibility who put principle before party to switch support from Obama in 2008 to Ron Paul in the presidential primaries in 2012, I am often asked what the Blue Republican movement will do next. The answer is manifold. It will continue to expose the Left vs. Right divide as a distraction as both main parties continue to offend the most basic Liberal AND Conservative values. It will continue to support the takeover of the GOP by peace-loving, liberty-loving Constitutionalists, and it will continue to work to ensure that the disillusioned, Independent middle, comprising liberal and conservative-leaning voters, will swing their vote to candidates who care about civil liberties, peace and financial responsibility. The ultimate goal is to influence policy by forcing mainstream candidates to address these issues if they want to secure the median voter, which is required to win elections in a two-party system. 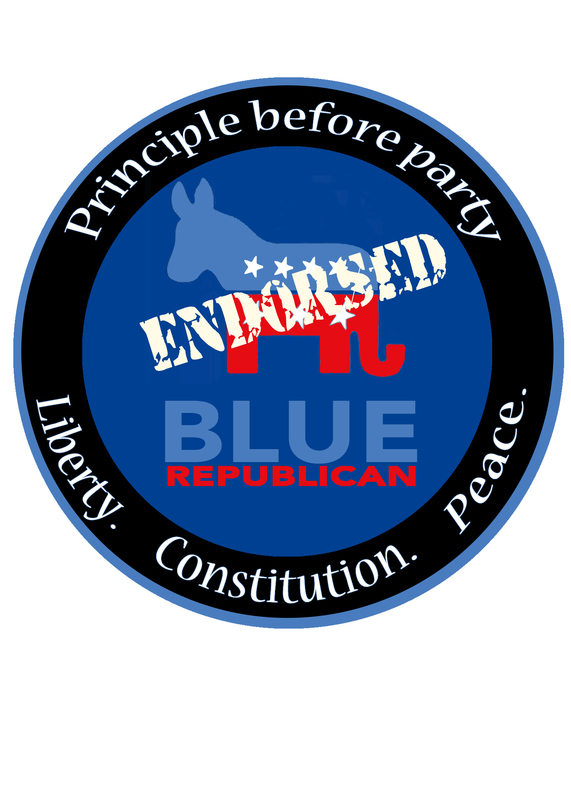 Part of this effort will be the official Blue Republican endorsement of pro-liberty, pro-peace, pro-Constitution candidates - especially in more Liberal parts of the country. Bemis understands the Blue Republican case that statism and progressivism have failed to deliver a fair society and economy or a free and empowered citizenry. Like the Blue Republicans, Bemis can see that many of the Left's favored means over the last couple of generations have actually moved the nation away from their stated ends. For all of these reasons, Blue Republican's first endorsement in a Congressional race goes to Ron Bemis, candidate for Congress for Washington's 7th district. The road to dis-establishing our one-party-with-two-flavors Establishment will be a long one. The threshold at which exasperation with the political status-quo becomes a historic political upset is necessarily high. But Bemis should take heart from the fact that his district includes multiple precincts in which the GOP primaries were won by Ron Paul - thanks mostly to voters who had voted for Obama in 2008. And if ever a non-incumbent, non-partisan, liberty-loving, grassroots candidate with next to no money can win a seat in Congress, we shall have electoral proof of the shift in the political zeitgeist that many of us are convinced is happening. As we know, "Ron" is a good name for an against-the-odds Congressman who puts store by a plain reading of the Constitution. When this session of Congress ends, America will be down by one Ron. How wonderfully unlikely it would be if Seattle, of all places, were to give us another one.